The acquisition and reacquisition system includes a foot detecting system that detects using both depth and color images of various characteristics of a person’s foot, shoe, and/or bottom portion of one or both of the person’s legs. Once the foot characteristics are acquired, the system creates a foot descriptor, such as a foot model of the individual’s foot and stores the foot descriptor, along with any additional individual information (e.g., name, interests, hometown, etc. ), in a database. 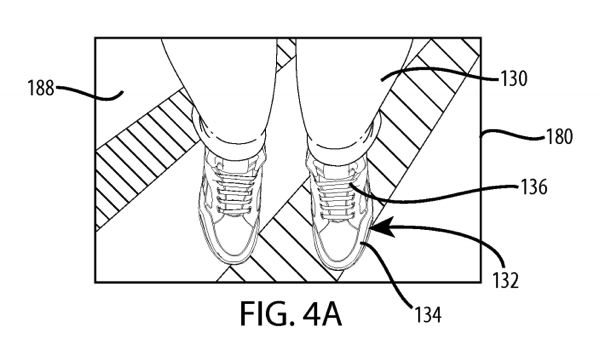 As the individual moves throughout the entertainment venue, a reacquisition detecting system detects one or more various characteristics of the individual’s foot, shoe, and/or leg and attempts to match the foot characteristics with a pre-stored or previously acquired individual. When a match is detected, the system provides an output to provide a customized or tailored experience for the guest. Finally, shoe styles typically vary widely in appearance and color, helping to reduce confusion for the system in identifying a particular person and in instances where two people have the same or similar shoes, the system can also use additional information, such as lower leg data, tread wear, or foot size.